I saw this scene first at the ground level. This is a bar on the South Street Seaport in lower Manhattan, right on the Hudson. 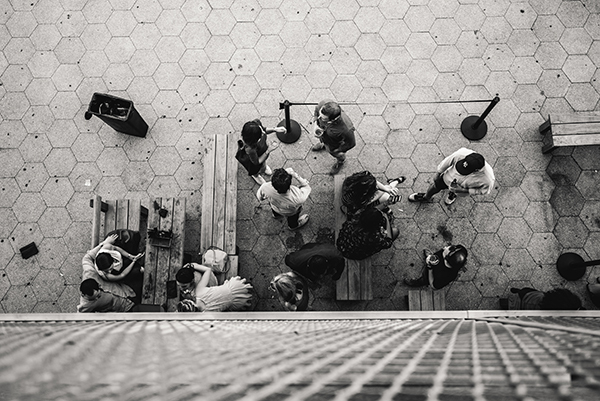 I walked up from the riverside and saw the people milling about and thought it exemplified just hanging out in the city. I didn’t want to take the picture straight on, though, so I went up to the top of the building and shot down instead with my 15-30. I thought it was a more interesting vantage point, and it also offered a bit of anonymity as well. I liked the contrast of the lines of the metal gate leading down into the pattern of the hexagons below. 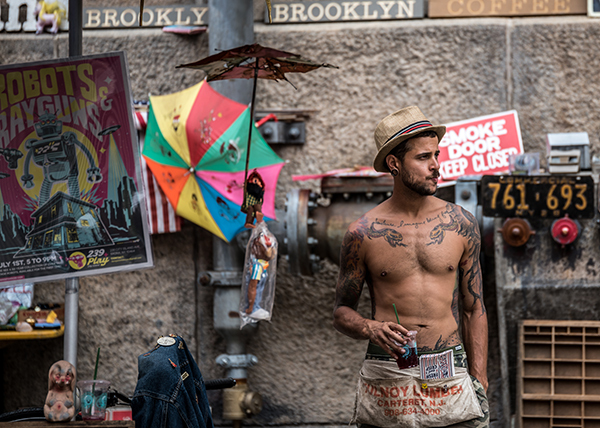 This was a vendor in an outdoor flea market, and as soon as I saw him I thought, “Wow, I’ve got to photograph this guy.” He looked like a model you’d see in a Gap or Old Navy ad, with that tattoo under his clavicle reading, “Sometimes I imagine being free.” I also loved all of the different elements that complemented the photo, including the retro items he was selling. By placing the words “Brooklyn” into the top of the frame, I was also able to establish a place for the photo. I used the 70-200 for this, zooming all the way in to 200mm to capture this candid moment. I grew up in Washington Square Park, where this photo was taken, and it holds many fond memories for me. I would spend nights in this park, and I recently took a trip back to New York for the purpose of retracing a lot of my footsteps. This guy was a typical New Yorker, sporting a look I’ve seen many times in my own life—he’s wearing those signature boots, for example, which an old friend of mine who was a punk rocker used to wear back in the day. I identify with the look. Plus, the dog reminded me of Toto from the Wizard of Oz. 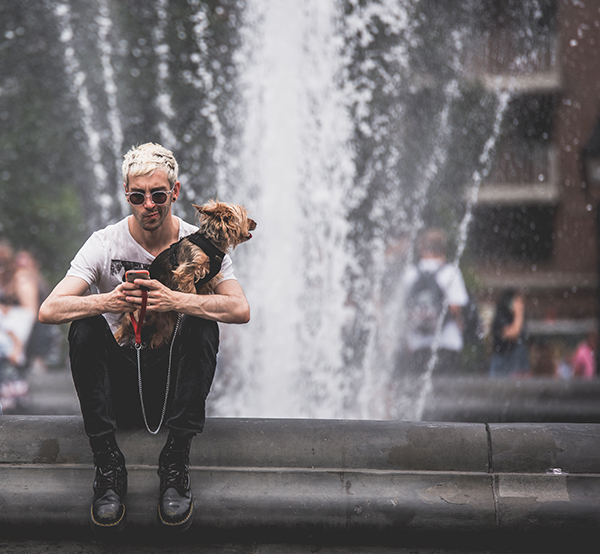 In terms of the fountain, I wanted to add that in to make the image a little more dynamic, but without taking away from my subject. I blurred it out just enough so that the dog owner was still clearly the focus of the photo. I love black-and-white photography, but sometimes a photo just calls out for color. 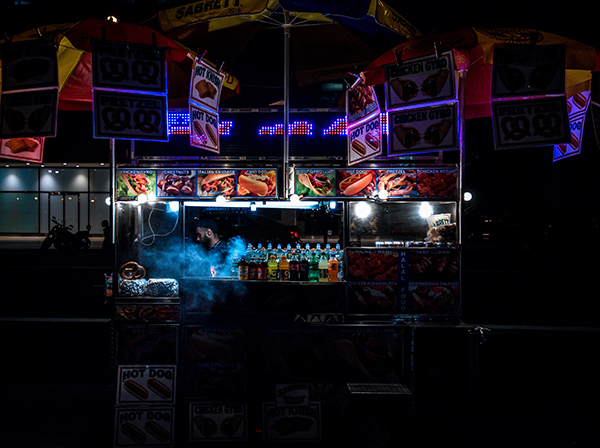 This night scene of a food stand in New York City was taken on 42nd Street with the Tamron 15-30 as I was heading west from the East Side. Now, I don’t usually eat the type of food you find at food stands like this, because I tend to eat healthier fare, but I wanted to take this photo because it’s the type of fast food that many New Yorkers live off of, even well into the night. I even called this photo “Farm Fresh,” as a tongue-in-cheek reference to what clearly isn’t farm-fresh food. I loved the color of the signs on the stands and the lighting. It wasn’t hard to expose for, since there was enough ambient light. I didn’t want it to be completely exposed anyway—I like the fact that there’s some shadow in the photo. I really wanted the focus to be on the light that was over him, where the steam was rising up over his cooking. Shooting it at 1/800th of a second at F/2.8 did the trick. This photo was taken in Times Square, where I was visiting after more than a year’s absence. I was there for hours with my camera, just waiting for photo opportunities to pop up. I was across the street, under a scaffold trying to stay dry, when I noticed this couple with their baby. You can’t see the dad, who’s behind one of the planters. But the real focus was on the mother and child. 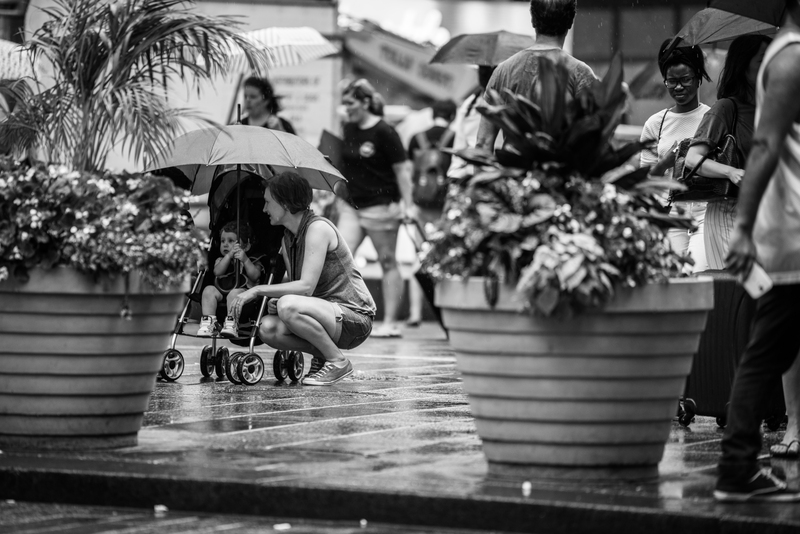 The beauty and intimacy of the moment just struck me, especially since the child was the one holding the umbrella while the mother knelt down next to the stroller in the rain. It was a warm, comforting scene. This photo was taken out of photographer’s envy. It was taken on Fifth Avenue, right near Tiffany and Co., an extremely ritzy area of Manhattan. The woman was a model on location, being fussed over by a team of people. I was across the street with the 70-200mm lens and I was able to steal that shot as the photographers commissioned to take her picture were at work doing the same. It would be a dream for me to have that kind of opportunity in the near future, with a model all styled with hair and makeup, and a team taking care of all the other logistics so I could just concentrate on composition. 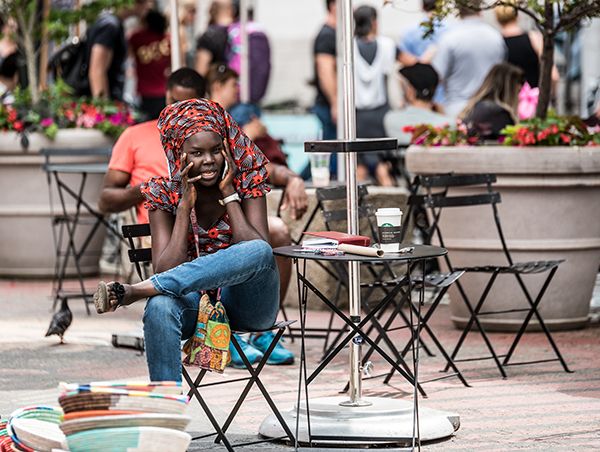 This woman is a vendor at an outdoor flea market, selling straw bowls, and she was sitting down during a break and taking a call. She happened to look up as I was taking the picture with the 70-200, but it’s not like I asked her to pose, so it still looks natural and authentic. Everything about this scene made for a great color photo, from her flawless, incredible skin to the colorful headwrap she had on to the tapestry of the bag she was carrying. The fact that you can see part of “New York” on the bag also gives a sense of place, like I discussed earlier. Although she was my subject, I wanted the bowls in the image also, so I placed them subtly in the foreground. Louis Mendes is probably one of the most photographed photographers in the world, and a centerpiece of the New York City landscape. 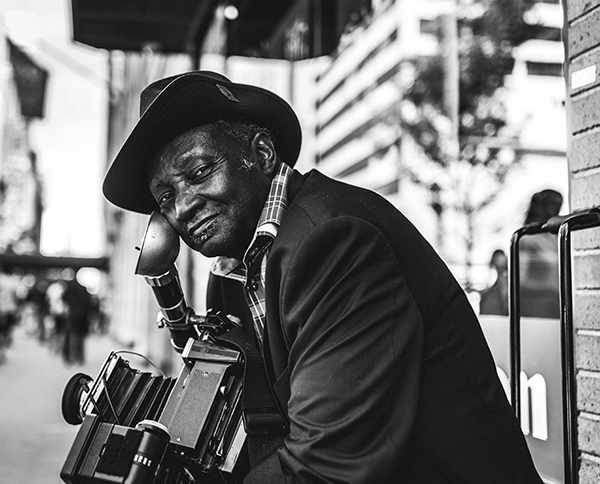 I was returning a lens on Ninth Avenue last year, and he was out there taking pictures; he frequently stands in that location and takes people’s portraits for a fee. I spotted him, and he looked so interesting and distinguished, from the way he was dressed to his classic 1940s camera. I walked up to him and started a conversation with him and it led to this portrait with the 35mm. To see more of Dominic Cox’s photos, check out his Instagram @PhotographyIsTheMuse. Visit Bergen County Camera to prepare for the Holiday Season. We’re always willing to answer your questions and help make your photos great. Looking to upgrade your camera? Visit us now and we’ll help you find the right camera for your life, set up your camera, and make sure you have the knowledge to feel comfortable using it. We’re often the same prices as the big box stores, only with staff and service there to help you learn and enjoy photography. 1. Turn on your camera. If your camera did not turn on it may need the battery charged, possibly it may need a new battery, or the camera may need service. Bring it in and we’ll get it working for you. 2. Check your memory cards. Always have a back up memory card in case your memory card becomes corrupt. 3. Seeing spots in your photos? A sensor cleaning may be required. We preform next day sensor cleanings. Take your camera out and use it to be sure it’s not showing any other issues. Should something be not acting correctly, bring it in, we’ll get it working right and help make sure your Holiday photos are great. Photography is the art of capturing a moment. Light and time caught and preserved for the enjoyment of all. While I can easily describe the amount of time it took to take a photograph, (in the accompanying photo 1/800th of a second) describing the amount of light is a little more complicated. Your lens features a system which controls the light entering your camera. Much like the pupil of a human eye shrinks and grows depending on how much light is entering the eye, the lens has aperture blades which shrink the opening of the lens so the right amount of light enters for proper exposure. When we describe how much light is used in creating an image, we describe how much light is entering the lens, known as the f-stop, through the opening of the lens, the aperture. The lower the f-stop number, the higher the amount of light entering the lens. So an f-stop of 1.8 is letting in more light then an f-stop of 5.6. Varying apertures can have dramatic effects on your photographs. Changing the aperture of your photos will both alter the depth of focus in your photos as well as the minimum shutter speed for proper exposure. Depth of focus is how far into your photo objects appears clear. When I use an aperture of f/1.8(lots of light entering the lens) objects in the foreground and background of where I focus will appear soft or blurry. Oppositely if I use an aperture of f/32(little light is entering the lens), both the subject I focus on, as well as both the foreground and background will be in focus. When shooting in low light environments, changing the aperture of the lens to allow as much light in as possible will result in a quicker shutter speed and a sharper image. This often allows for taking photos without a flash even when there is low light. In landscape photography, changing the aperture will allow an increased depth of field and more subjects in focus. Lenses can have either a fixed or variable aperture. In variable aperture lenses, the maximum aperture changes depending on what focal length you’re using, or how far you’ve zoomed your lens. To find the aperture of your lens, we’ll take a look at a Nikon 18-55mm lens. Look at the front of the lens. 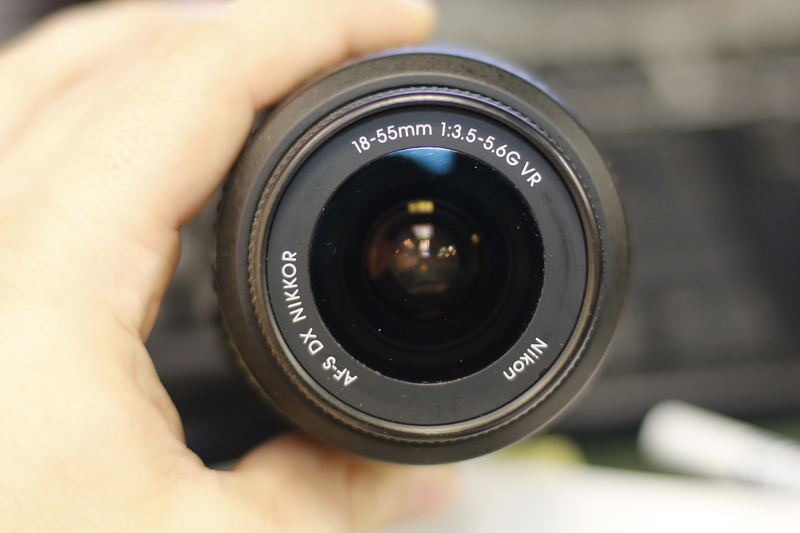 There is a sequence of numbers on the front of the lens telling you the focal length of your lens (18-55mm) and a ratio showing the aperture (1:3.5-5.6). This is telling you that your lens is a variable aperture lens where the lowest possible aperture of your lens is f/3.5 at the shortest focal length (18mm) and f/5.6 at the furthest focal length (55mm). In taking both portraits and everyday photos, low aperture lenses can make your photos much more interesting at a low cost. Confused or want to learn more? Visit Bergen County Camera to learn more about aperture, lenses, and other ways to improve your photography. 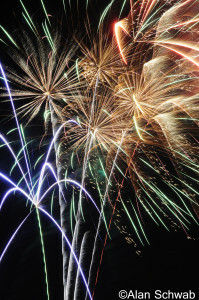 Bergen County Camera employee and photography expert Alan Schwab recently hosted our focus session on fireworks photography and created this tip sheet! 1. Set your camera to Bulb Mode. If there is no Bulb mode on your mode dial, check in Manual Mode. Change the shutter speed to the longest possible (Often switches from 30 seconds to “Bulb”). In Bulb Mode, the shutter will stay open as long as you hold down the shutter release. 3. No Long Exposure Noise Reduction, high ISO NR can stay on but is not needed. 7. Focus your lens manually on infinity. Test where infinity is by focusing on the furthest possible object your lens can resolve sharply. 9. Vivid color mode, leave saturation at normal, landscape (picture style) for Canon users. 14. Tripod will possibly need to be re-positioned (tilt etc.) once show starts. I’ll shoot vertical more often then horizontal. 16. Fire Shutter (Cable Release) hold rather then lock. Hold for multiple bursts. (2-up to 8 maybe more) Check monitor, exposures should average 2-4 seconds although exposures can last up to 15 seconds. Disregard the histogram. 17. Finale shots need to happen quicker then the rest of the show. 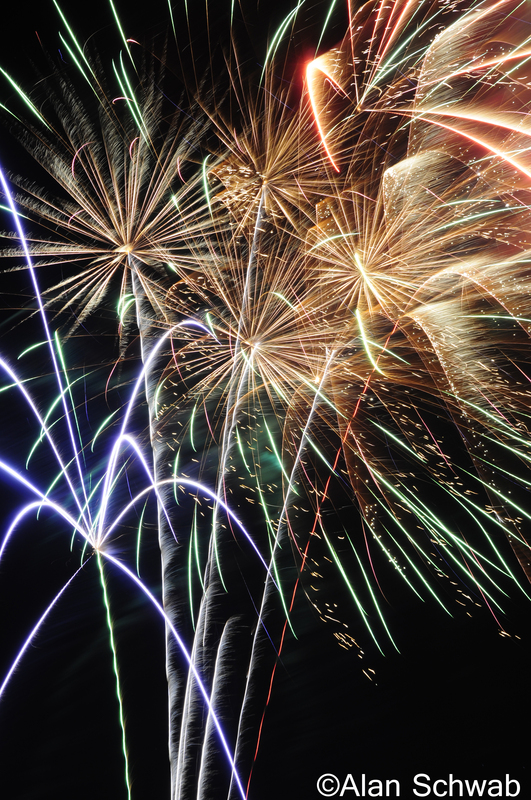 These shots can become over exposed quickly due to the number of fireworks exploding. Shutter speeds during the finale can range between 1 second and – 1/30th of a second. 18. JPEG or RAW format. RAW is not necessary unless you feel the need to recover highlights. Shoot JPEG or RAW together or just JPEG. Use a fast card for recovery of write speed times. Raw will offer more color bit information. 19. Bring extra cards, batteries, mini flashlight. The show may be 30 minutes to an hour long. Be careful inserting a memory card in the dark. 20. Add an element of scenic interest to your pictures. 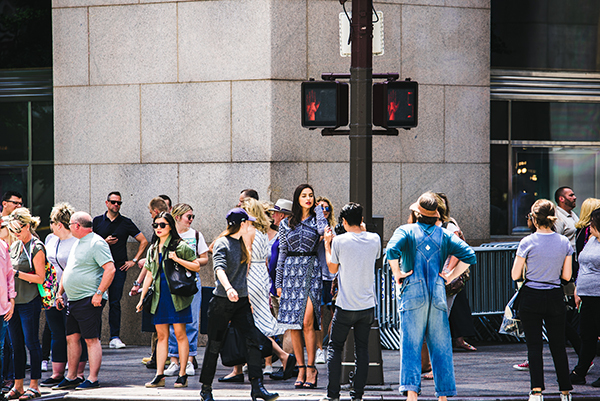 Look for a location which has a bridge, skyline, or crowd. As always, if you have any questions about this or any other photographic subject, feel free to stop by, give us a call, message us on facebook, or comment below. Looking to take a great photo of Dad? Indoors or outdoors, we’ve got some tips to improve your images. Outdoors portraits require attention to light. Watch for irregular shadows on your subjects. Remember to use your flash to fill in the shadows, even if you’re outside in daylight. This is especially important if Dad is wearing a hat. Use Aperture Priority on your camera to blur out the background in your images. 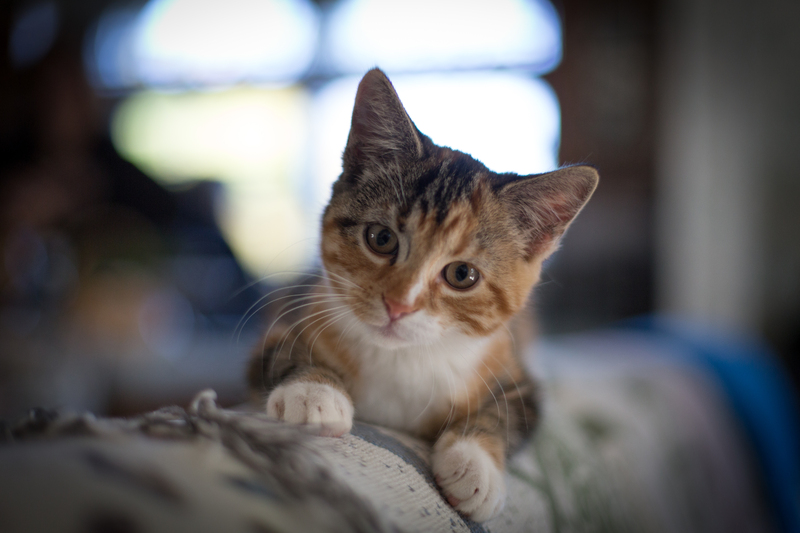 This creates a less distracting and pleasant background for your subject. The lower your f-stop, the more background blur. But pay attention to your shutter speed. Adjust ISO to keep your shutter speed between 1/60th and 1/2000th of a second. Indoor flash photography is tricky. Harsh shadows can become distractions in flash photography. Use a flash diffuser. Diffusers soften the light produced by flashes and create visually pleasing images. Also try bouncing your flash off the ceiling. This will move the shadows closer to the ground and usually out of your images. Remember that some of the best photos you will take of your family is of them acting naturally. Don’t wait for everyone to get together and post to take your photo. Take some photos throughout the day. Outdoors or indoors, the right lenses go a long way. Indoors use a lens with a low aperture. We rent several 70-200mm f/2.8 lenses for both Nikon and Canon cameras. This lens is ideal for indoor, low light shooting. When shooting outdoors, aperture is less of a factor. You’d be better with a lens giving you more distance. We rent a Canon 100-400mm and a Tamron 200-500mm lens for Nikon which would be ideal for outdoor graduation ceremonies. If you’re taking blurry photos, raise your ISO. ISO is the sensitivity of your camera’s sensor to light. Make sure your shutter speed is at least 1/60th of a second. The higher the shutter speed, the less motion blur in your photos. Practice makes perfect. Prepare yourself for the diploma transfer photo by practicing taking photos of earlier students making their walk. Take your time. The leading cause of bad photos is panic and excitement. Take your time, focus your self, focus your camera, and take the right photo. Yes, burst mode is wonderful, but one great photo is better then a dozen blurry. Have questions? Stop in to Bergen County Camera and let us help you become the photographer you want to be. Historical Posting – Originally published in our In Focus Newsletter in 1998 – Since this is an archived story – products mentioned may not be available or even made any more – Let us know if you have any questions. One of the least expensive and easiest ways to improve your image sharpness whether using digital, video or film is to purchase a tripod. A tripod becomes more important when you’re using a telephoto lens or shooting in low light conditions. A good rule of thumb when shooting film is that a tripod should be used when the shutter speed is less than 1 / [focal legnth of lens in mm]. With this rule in mind, shooting with a 300mm telephoto you would want to use a tripod when below 1/300th or 1/500th of a second. Even at higher shutter speeds a tripod will eliminate camera shake that comes from hand holding your camera and produce sharper images. If you’re planning on making big enlargements, using a tripod will help to ensure the sharpest possible image. With video cameras, a special type of tripod head is used called a fluid head. The fluid head allows you to smoothly move the camera while following the action without bouncing up and down. In places where tripods are too bulky and cumbersome, many people opt for a single leg of a tripod or monopod. A monopod helps to steady the camera in place where a tripod would be too inconvenient to use. A monopod also doubles as a good walking stick. Tripods come in all shapes, sizes and prices from tiny tabletop tripods to full size 6′ tall models that will support a professional video camera. Stop by Bergen County Camera and we’ll be glad to show you several models that can improve your photography. Are you using a VR or image stabilizing lens? Be sure to check your lenses owners manual to determine the correct setting. Many VR and image stabilized lenses need to be shut off when used on a tripod.